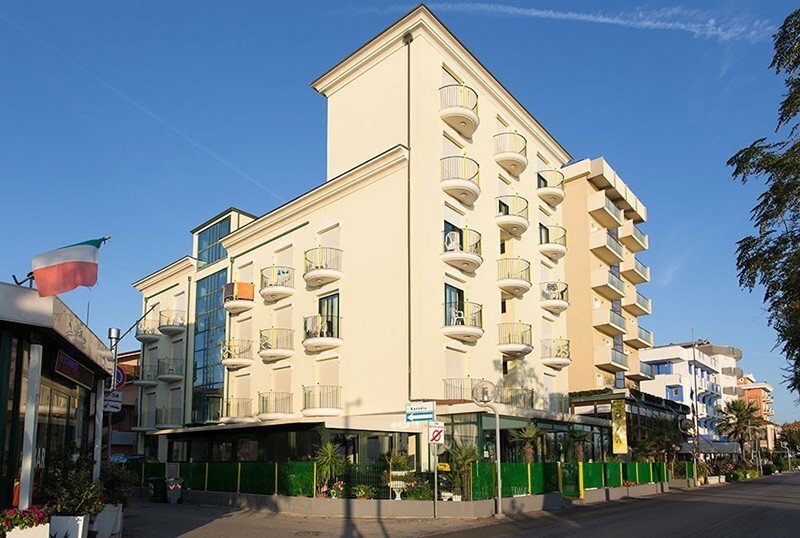 Hotel Emilia is a 3-star family-run hotel located in Torre Pedrera di Rimini, just in front of the beach. It offers services for children, rooms with sea views and a cuisine prepared directly by the owners with the possibility of menus for coeliacs. The hotel is located on the seafront of Torre Pedrera, a hamlet north of Rimini, on the front line right in front of the sea. To reach the beach, simply cross the road. All rooms have a balcony facing or sea view, bathroom with shower, satellite TV, minibar, telephone, WI-FI, air conditioning and heating with independent regulation, hairdryer. Breakfast in the room on request. FAMILY: triple and quadruple rooms with bunk beds available. Open-air porch, hall, bar, elevator, laundry service. The hotel is equipped for cyclists. PARKING: free and guaranteed parking spaces in the hotel or nearby with free shuttle service; garage on reservation and for a fee. BREAKFAST: buffet with homemade desserts, croissants, yogurt, fresh biscuits and savory products. LUNCH AND DINNER: the kitchen is managed directly by the owners and offers a 3-choice menu with traditional dishes of local cuisine, followed by a buffet of appetizers and side dishes. VARIATIONS: alternative menus for coeliacs and vegetarians, on request. In hotel: outdoor playground area, entertainment service, pediatrician (on request). At meals: kitchenette for preparing baby food, baby menu, high chairs, bottle warmers. The hotel has an agreement with the bathing establishments in front: Bagno Rinato n. 68/69 with baby room, WI-FI, sports fields, live entertainment, library, gym; Bélaburdéla bath n. 70/71 with bar, sports fields, playground, entertainment for children. For the months of May and June one child per room together with two adults up to 5 years free. One child per room up to 5 years in room with 2 adults free. Special offer for the whole month of July! Weekly stay in Formula All Inclusive starting from € 440.00 per person for 7 days. Discounts for children up to 14 years.